"..I followed the directions on your article and now have wonderful sprouted millet. Your spray millet is far superior to others on the market. Thank you for providing such wonderful products"
After protein deficiency and vitamin A deficiency, a lack of sufficient vitamin D in the diet of cage birds is probably the third most common deficiency noted in their feeding. The classical symptom of a deficiency of this vitamin in human nutrition has been rickets, a disease produced as the bones fail to harden and grow properly, instead becoming curved and incapable of supporting the weight of the body. Rickets in the past has been a scourge of the northern European countries and the deep mountain valleys of areas like Switzerland where the winter sunlight does not penetrate, since direct sunlight allows the body to synthesize this vitamin. There are two primary forms of vitamin D in nature. The first has been classified as vitamin D2, with the technical name of ergocalciferol. This form of vitamin D is easily used by dogs, humans and most mammals, but it cannot be used by birds. Vitamin D2 occurs mainly in plant sources in nature. Thus, any bird diet that is composed solely of plant products, such as seeds, greens, fruits, vegetables, etc., will not contain any vitamin D that is useful for the birds. When a provitamin compound called ergosterol is irradiated with short wavelength ultraviolet light, it changes in form to become ergocalciferol, vitamin D2, and this is the form that is added to milk to increase its vitamin D content. Any bird that is maintained on a diet that contains only vitamin D2 will soon suffer from the symptoms of vitamin D deficiency. For birds, only the form of this vitamin called cholecalciferol or vitamin D3 is biologically available. Vitamin D3 is found only in animal products such as eggs, milk, insects, and liver. Since this is the only form that birds can use, a seed diet must contain a food from an animal source rich in vitamin D3 to provide enough of this vitamin for the birds' health and reproduction. Any birds that are exposed to direct sunlight for at least an hour a day will be able to synthesize their own vitamin D on the skin, as will be explained later. 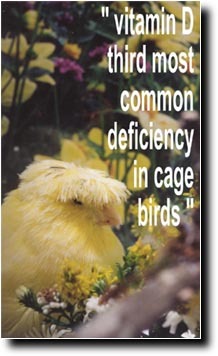 There are a variety of symptoms of vitamin D deficiency in cage birds, most of them related to calcium. In addition to the soft bones of rickets, in birds thin-shelled and soft-shelled eggs will be a prominent symptom. Clutches that are smaller than normal will also be a symptom of too little vitamin D in the diet. Vitamin D3 is crucial to the absorption of calcium in the digestive tract, and any problem with the absorption of calcium may be caused by vitamin D deficiency. Also, eggs that lack sufficient vitamin D will fail to hatch. At one point in my early breeding efforts, after reading of the beneficial effect of vitamin D for eggshell formation and calcium use in the avian body, I began supplementing my birds' diets with additional powdered vitamin D3 each day. I was totally unprepared for the result. In a birdroom with about 80 pairs of finches, the next clutches laid increased in size by about 50%. In other words, the birds that had laid four eggs began laying six, those laying five eggs began laying seven or eight, and those already laying seven eggs began laying 10 eggs per clutch. The additional vitamin D in the diet had made the hens' absorption and utilization of calcium so much easier that the clutch size had increased dramatically. A pair of Diamond Doves I had purchased at around the same time also showed the rapid effectiveness of adequate nutrition and vitamin D3 supplementation. I could tell by the feather condition that these new doves had been poorly nourished. As soon as they settled down, and before they began eating the egg mix and cage bird crumbles that I supplied, they went to nest and the hen laid her clutch of two eggs. Both were soft-shelled, indicating a very serious deficiency of vitamin D3 in their diet. From the day I received them, the pair had cleaned up a quarter to a half teaspoon of crushed eggshells each day, a huge amount of calcium for two birds this small, yet the hen had been able to absorb none of it. In order to get these doves to begin eating the good nutritional items that were in front of them and would prevent these problems, I removed all seed from the pair until I observed both of them eating both the crumbles and the egg mix. A week later, the hen laid again, and this time both of her eggs were perfectly formed. In any case of poor utilization of calcium in the diet, always suspect a serious deficiency of vitamin D3 first. Keep in mind that any diet that is exclusively plant products, with no vitamin supplement that contains vitamin D3 added, will be totally lacking in this vitamin. The result in hens will be thin-shelled or soft-shelled eggs. In babies, the bones will not harden, but will remain soft and pliable, unable to support the weight of the bird. Vitamin D3 is a fat soluble substance in the avian diet. If there is very little in the way of fats and oils in the diet, the absorption of this vitamin will be very poor. When fat absorption is poor, the amount of vitamin D absorbed will also be poor. Also, Vitamin D is absorbed only in the presence of bile, and absorption occurs in the duodenum, the first section of the small intestine in birds. Vitamin D is stored by the avian body only in limited amounts, and this storage occurs primarily in the liver. Fortunately, vitamin D is very stable. Vitamin E, acting as a natural antioxidant, protects vitamin D in the body and keeps it from being destroyed by such compounds as peroxides. Acids, alkalis, heat, light, storage, and freezing normally do not destroy vitamin D, and it is one of the most stable of the vital nutrients that we call vitamins. For birds that are maintained in direct sunlight, the short wavelength ultraviolet light in the sunlight aids in the formation of vitamin D3 on the skin. The exposed skin of the legs, feet, around the eyes, and in other areas on some birds, exude an oily compound called technically 7-dehydrocholesterol. When the ultraviolet rays strike this substance, they produce a chemical change that transforms it into cholecalciferol, vitamin D3. 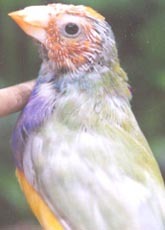 The vitamin is then resorbed into the skin over a period of time to supply the birds' vitamin D requirement. These ultraviolet rays cannot penetrate window glass, though they will go through quartz glass and most clear plastics. 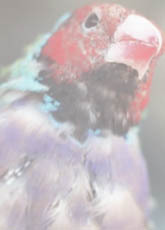 For birds maintained indoors, window glass effectively prevents any vitamin D3 formation from this synthesis on the skin. Many types of artificial lights also emit ultraviolet rays, but few of them have the intensity necessary for the synthesis of vitamin D3 on the skin. The presence of short wave-length ultraviolet rays alone is not enough; the intensity of the rays is also crucial. Natural sunlight, of course, has the intensity necessary. A sunlamp also has the intensity, and exposing the birds for less than an hour each day will allow the synthesis on the skin of enough vitamin D3 to keep the birds in perfect health. However, the full spectrum lights do not emit the intensity necessary for the formation of vitamin D3 on the skin. Even the commercial black lights, which emit a very high percentage of light in the ultraviolet range of the spectrum, do not have the intensity required for vitamin D3 synthesis. Many breeders for over a hundred years have recommended the use of cod liver oil for the health of cage birds, even though they did not then know that this oil was an excellent source of both vitamin A and vitamin D in cage bird diets. We now know that the livers of sea fish abound in both of these vitamins, and cod liver oil in particular has been available almost since commercial fishing began. If this oil can be provided in a readily consumable form, it is an excellent and easily available vitamin D source. However, it becomes rancid very rapidly on exposure to air. If you can mix it with something that the birds will consume completely within about 15 minutes, the danger of rancidity is minimal. Remember that rancidity in oils of this type is cumulative, and the longer the oil sits exposed to the air, the worse it gets. For many years, I have chosen to mix a powdered form of vitamin D3 with the egg mix that I feed to all of my birds daily. This powder is safe from rancidity, yet gives the birds the vitamin D they need in a form that they eat readily and will clean up each day. Powdered vitamin D3 is also added to all of the vitamin mineral supplements designed for avian feeding that are marketed in powdered form, and a teaspoon of any of the powdered supplements added to one mashed, hard-boiled egg, or any other soft food that the birds will eat readily, will give them all of the vitamin D3 they need for good health. The commercial poultry starters, game bird starters, cage bird crumbles and pellets, and monkey pellets all will contain adequate amounts of vitamin D3 for the birds' health. If you plan to try any type of dog or cat food for your birds, be sure to check the label carefully, however. Dogs and cats can use vitamin D2 in their metabolism quite effectively, and many dog and cat foods do not contain vitamin D3. Never forget that for birds the only metabolically active form of vitamin D is the type called vitamin D3, which is technically called cholecalciferol. If your birds have one good source of vitamin D, that is enough. Do not mix vitamin D3 with everything the birds eat, or you run the danger of an overdose. Vitamin D is the easiest vitamin to supply in greater amounts than the birds need, and just because a little is vital and good does not mean that a lot is better; it is not better, and it can be an excessive amount. An excess of vitamin D is technically called hypervitaminosis D. Too much vitamin D in the diet will cause a leaching of the calcium from the bones, and abnormal calcium deposits in the soft tissues of the body. In birds, this can take the form of kidney damage caused by the calcification of the kidney tubules. Keep all of this information in mind as you feed your birds, and you should be able to supply them with enough vitamin D for their health, with no danger of providing too much.